Whether Oreos are vegan depends on your definition of "vegan" and how strict your interpretation of the phrase is. While the cookie is not made with any animal products, which means it is technically vegan, purists say it isn't vegan because the ingredients may have "cross contact" with milk, an animal product. Cross contact is a phrase used in the food industry when addressing food allergies and lifestyle choices. It means production lines in the Oreo facility are not separated or isolated from one another. This is a critical term for people with food allergies. Milk is used in some of the products the company makes. Ingredients used to make Oreos could come into contact with milk or milk products at any time while the cookies are being made, so cross-contamination is possible. The cookie itself doesn't contain any animal products or by-products. However, if you are a strict vegan, Oreo cookies are not for you. What's in an Oreo Cookie? 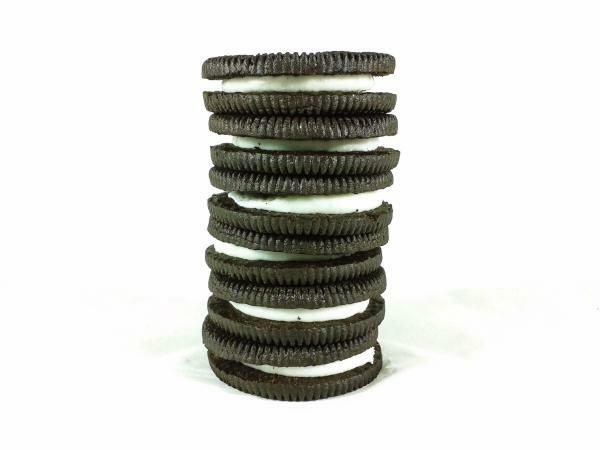 According to Snack Works, an Oreo cookie contains: Enriched flour, sugar, palm or canola oil, cocoa, high-fructose corn syrup, baking soda or calcium phosphate, salt, soy lecithin, chocolate, and artificial flavors. In other words, there are no animal products in the main ingredients list. However, for strict vegans, there is another problematic ingredient: sugar. Some sugar is processed using animal bone char, also called "animal derived natural charcoal." It's a product sometimes used to make sugar white. You can certainly make your own chocolate sandwich cookies to ensure they are vegan. Make a chocolate cookie and then make a filling using a vegan margarine or solid shortening and powdered sugar or vegan icing. Likewise, there is another brand of chocolate sandwich cookies that is vegan. Country Choice makes a chocolate sandwich cookie, and the company that owns them, Nature's Path, says the cookie is, "Vegan and kosher." If you feel strongly about the choices you make and are passionate about veganism, it would be wise to avoid Oreo cookies. However, the cookies are not made with products derived from animals, so you can be comfortable eating a cookie or two if your lifestyle isn't as strict.